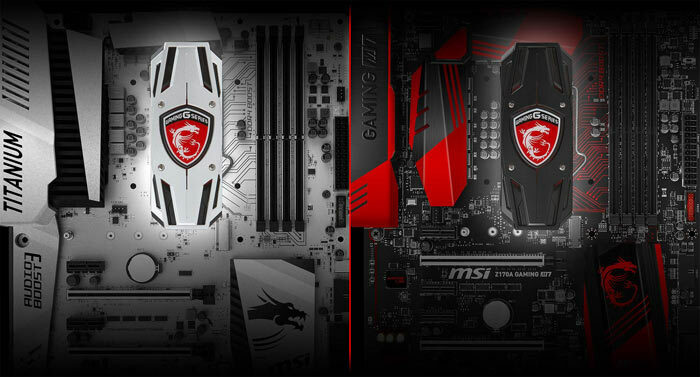 MSI has launched a CPU cooler using technology it has developed over its years as a graphics card maker. The MSI Core Frozr L CPU Cooler is a tower type cooler resplendent with aluminium fins, 4x 8mm heatpipes, a 120mm fan (upgradeable), and a nickel coated copper base. It comes with LED illuminated MSI GAMING top covers in both black and white, and it is compatible with all modern CPU sockets. The above picture makes the MSI Core Frozr L CPU Cooler look rather tall. The actual height is 155mm, and it is 140mm wide and 89mm deep (with a single fan fitted). As I've just implied by that statement, yes, it can have dual fans fitted in a push-pull configuration, for even better cooling performance. With single fan configuration the cooler will weigh 960g. MSI claims this new CPU cooler is "designed using all the experience and cutting-edge technologies of MSI GAMING products." This tech includes MSI's patented TORX fans which many of you will be familiar with from the company's graphics cards. TORX fans bring together two types of fan blades and a thrust bearing for impressive air flow and quiet (17.2 ~ 33.6 dBA) performance. Other important cooler specifications and components have been rightly considered and MSI has fitted the Core Frozr L CPU Cooler with a solid nickel-plated 38 x 39mm copper baseplate through which four 8mm heatipes thread to conduct the heat to the top 'Airflow Control' aluminium fin structure which the fan(s) cool. Furthermore its "smart base design" leaves space for a graphics card neighbour on the first PCI-e slot. MSI graciously supplies a syringe of 'Premium Thermal Compound X' to make sure that you get the best from its carefully constructed CPU cooler from the get go. Although this cooler has been heralded as being available in retail, I couldn't find any example being sold at the usual UK distributors online today. If you are interested in the MSI Core Frozr L CPU Cooler there have already been a couple of thorough reviews of the unit. 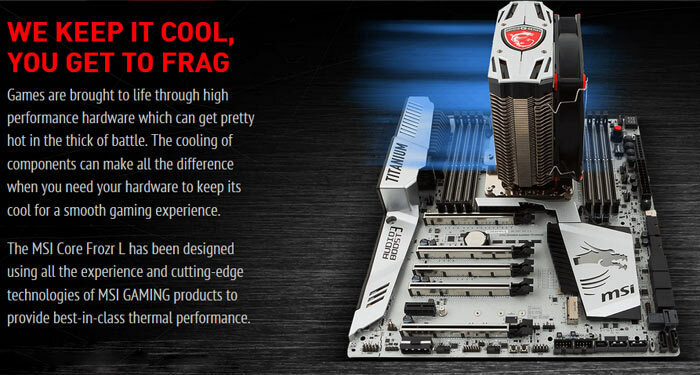 One by Bit-Tech commends MSI for its low noise and distinctive design. Another similarly positive review by Guru3D gives the cooler a 'recommended' award. 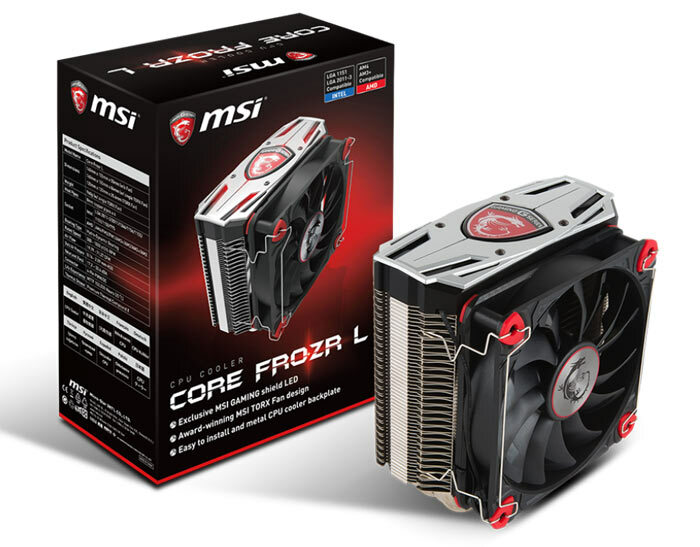 The MSRP of the new MSI Core Frozr L CPU cooler is $49.99 / £39.99 and it comes with a three year warranty. Looks very interesting at a decent price that won't break the bank, about time someone made a cpu heat sink that competes with a hyper 212. Literally just ordered a 212 Evo over the black friday weekend as amazon had £5 knocked off, not sure I would have bothered if I knew this was coming out. The slimmer design gives better clearance for the RAM compared to the 212 and of course, coupled with an MSI GPU this would look awesome. What about the Cryorig H7? It's larger than the 212 Evo, but just £5 more expensive. From what I can remember, it outperforms it handily. Doesn't seem to have much UK distribution though, but Amazon has it.